The past few years we have learned so much about how manage our horses’ diets so that we keep our horses healthy and happy. Specifically, we have developed a great deal of practical research about insulin resistance, laminitis, the glycemic indexes of different feed, and the carbohydrate content of pasture grasses, as well as how all of these factors interact. With all of this data in hand, this month I explore how we can provide our metabolically-challenged horses with a high quality of life. As the role of the horse has shifted from that of work animal to companion our breeding programs have changed. Our ideal equine companions are gentle, calm, steady creatures who are happy to be ridden but don’t mind just hanging out and receiving affection. This same laid-back horse is often also an easy keeper. He gains weight when he does nothing more than catch a whiff of feed! He is also the one horse out of the herd who is most likely to encounter the metabolic challenge of insulin resistance. So what happens when we turn out the easy-keeping horse into a pasture full of cultivated and rich grass? Disaster! As the horse consumes rich grass his blood glucose levels climb, causing his body to produce more insulin to compensate. Eventually the sustained high intake of carbohydrates in the grass overwhelms his body’s ability to control the glucose released into his blood. As result, the glucose levels rise, triggering laminitis and other symptoms of metabolic imbalance such as ravenous appetite, exercise intolerance, fertility problems, excessive thirst, or obesity. Regular exercise helps prevent obesity by allowing the insulin to work more efficiently (fat cells actually produce hormones that interfere with the action of insulin). 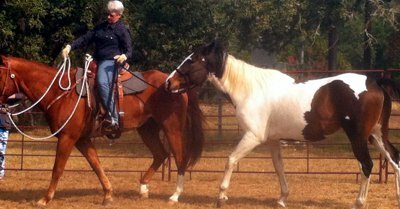 Even if you are not able to ride your horse daily you can exercise him by ponying him off another horse or driving him around the arena or pasture. Long slow walks are as good as or better than short periods of intense exercise. Monitor your pasture grass and limit your horse’s grazing when grasses are likely to be high in sugar, such as when the nights are cool and the days are sunny, after a rain or frost, or during a severe drought. Remove or severely limit access to clover. Keep your pastures mowed to encourage the grass to grow steadily, a process that causes the grass to use rather store sugars. It’s better to use natural rather than synthetic products to fertilize your pasture. Although most articles on pasture management suggest using liberal amounts of synthetic substances such as NPK fertilizers, I recommend against this approach. These types of fertilizers have a negative effect on the microorganisms in the soil that are necessary for plants to absorb minerals. Probiotics have a similar effect on mineral absorption in horses that microorganisms in the soil have on plants. Your horse needs minerals like chromium and magnesium for proper glucose metabolism, and probiotics assist your horse in absorbing these with maximum efficiency. Offer your horse high quality minerals that are designed specifically for horses and include a wide range of trace minerals. Horses do best with chelated minerals, of which there are two types: plant-based products that are naturally chelated and synthetic products that artificially chelate minerals by combining them with certain proteins. My favorite mineral supplements include blue-green algae, kelp, and free choice minerals from Advanced Biological Concepts. If you must offer grain to get supplements into your horse, I suggest giving low glycemic index feeds such as beet pulp, wheat bran, or Purina Equine Senior. For IR horses, any concentrated feed should be limited to very small amounts, on the order of a handful, to provide a flavor enhancement. If pasture conditions are unacceptable for long periods of time, consider letting your horse graze for limited amounts of time wearing a grazing muzzle to limit intake. It’s safest to turn your horse out during the early morning or on cloudy days. As counterintuitive as it might seem, giving fat to your overweight horse in the form of rice bran, cold-processed vegetable oil, or ground flax seed can be very helpful. These forms of fat help curb your horse’s appetite and slow the release of glucose into the blood. By placing your horse’s feed, water, salt, and shade in different locations your force your horse to cover as least a little ground every day. If your horse has to spend time in a dry lot then scatter his hay as widely as possible to keep him moving while he is eating. Utilize native grass pastures if possible for grazing. Native grasses are safer since they have not been genetically selected for either rapid growth or high sugar content. If these pastures are mowed regularly and not overgrazed they may not need any fertilizer or additional weed control. The laminitic horse needs more antioxidants than the average horse to stay healthy and comfortable. Because his cells function less efficiently his body is more prone to create a heavy free radical load. Adding natural antioxidants such as Tahitian noni to your horse’s diet can significantly reduce the free radical load.